Election Day is finally here, and the two major party candidates — Hillary Clinton and Donald Trump — joined the rest of the country at the polls today to cast their votes for president. Secretary Clinton cast her vote in Chappaqua, New York on Tuesday morning, surrounded by a crowd of supporters, while Donald Trump cast his vote in New York City, surrounded by a crowd of booing opponents. Unfortunately, the Republican presidential candidate's problems didn't end there: Donald Trump appears to be looking at his wife's ballot in a new photo, sparking speculation that Melania Trump may not be on-board the Trump Train. 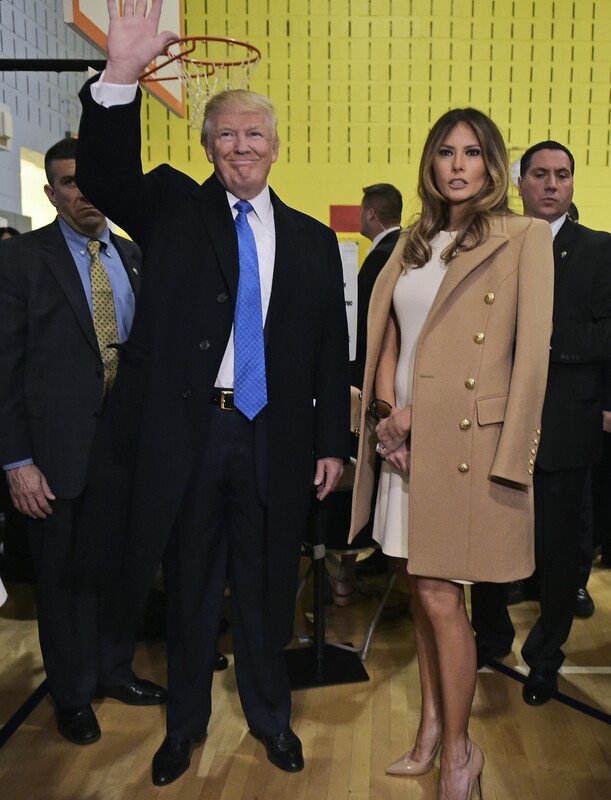 I don't know for certain if Donald Trump was looking at his wife's ballot or just, um, stretching his neck. But consider that Trump has been accused of adultery and sexual assault at multiple points during this campaign. If those allegations are true, certainly no one could blame his wife for casting a vote for the other side. Seriously, guys, according to the New York State Voter Bill of Rights, voters have the right to secrecy in voting. So let your wives vote the first female president of the United States, if they so choose.